cut in her nose. So she was a bit embarrassed. But the other sunshine-girls insisted that she’d go on the picture with them. That’s why she’s on the side. Don’t tell my daughter, she didn’t even notice and she adopted very happily this doll and gave her the name Carolina. 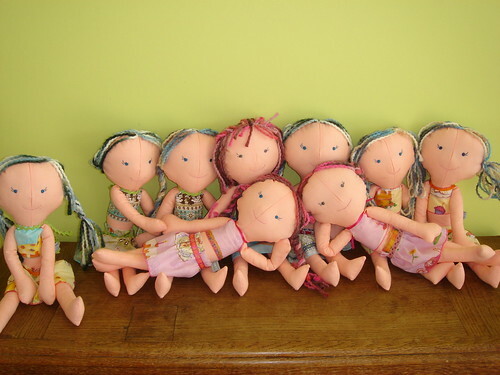 These dolls love sunbathing, they wear little knickers, made of the same fabric as their skirts. They have movable legs with a hidden button. I learned this technique at mimi kirchners blog. Here’s were you can read this great tutorial! 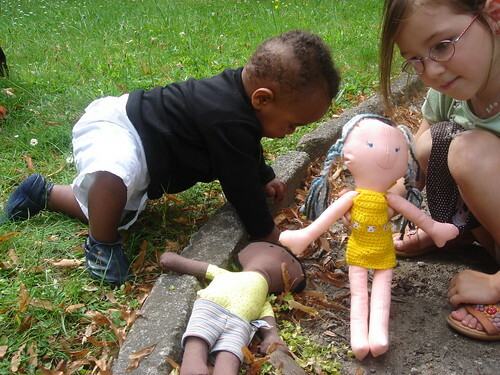 You can see all 8 dolls at flickr! And 6 of them will soon be are for sale at my etsy-shop, but i have to figure out how that works. Those are so neat! Where do you sell them at?